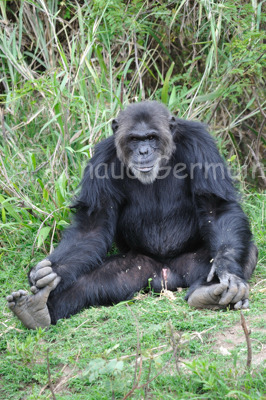 Niyonkuru is the big dominant male of one of the two groups of chimpanzees at Ol Pejeta Conservancy. He is very impressive. I managed to take some pictures of him across the river as he was watching us. The two enclosures where the two groups live are huge (1/2 km2 each). Nikon D700, Sigma 150-500mm OS at 350mm, F6.3, 1/1250s, ISO 800, Gitzo tripod.